Last month, in What’s That Conifer? (Part 1 of 2), we detailed the genera of the Cupressaceae family found in the Chesapeake Bay Watershed. Still pining for conifer identification knowledge? 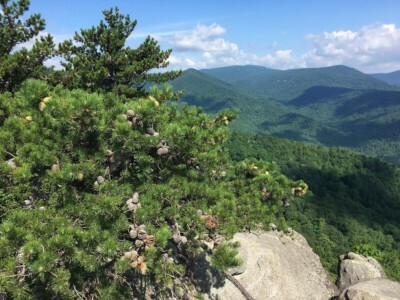 Read on to learn about the Pinaceae family, which contains firs, spruces, hemlocks, and of course, pines. Pinaceae is one of the most important tree families in the northern hemisphere; members of this family (in particular spruces, hemlocks, and firs) dominate the cold, harsh forests of boreal, northern, and high-elevation areas, while others (particularly pines) dominate huge swaths of the southeastern and montane southwestern US. The Chesapeake Bay’s vast watershed extends from cool climes in New York and high elevations of Pennsylvania, West Virginia, and Virginia, where we find some small populations of otherwise northern spruce and fir species, to the southeastern coastal plain, where pines reign supreme. Table-mountain pine, Pinus pungens. The long bundled needles of pines are easy to tell apart from the leaves of other conifers. Photo credit: Ryan Davis. The genus Pinus holds the most diversity of any other eastern conifer by far; nine pine species are found in the Chesapeake Bay watershed alone. Pines have evergreen, needle-shaped leaves that are held in bundles called fascicles. Pines hold onto their needles for multiple years, but lose 20-50% each fall, leaving a thicker carpet of needles relative to most other evergreen conifers. Pine needles have a very low pH and are often thought to drive up soil acidity, but they break down so slowly that they typically only lower the soil pH slightly. Their real interaction with neighboring plants is through shade; dense pine crowns are excellent at preventing much light from reaching the forest floor. There are two main subgenera of pines: soft pines (of which eastern white pine, Pinus strobus, is the only eastern species), and hard pines. Soft pines typically have 5 needles per fascicle, cones without prickles, and woody fascicle sheaths that are shed each winter. Hard pines typically have 2 or 3 needles per fascicle, cones that are “armed” with prickles, and persistent fascicle sheaths. Pines are commercially and culturally important. They have versatile, nonporous wood that is currently used heavily for lumber, plywood, and pulpwood. For several centuries of European occupation, pines were a significant source of lumber for building homes and were an important source of ship masts and resin for shipbuilding. One species in particular, longleaf pine (Pinus palustris), dominated most of the southeastern coastal plain before European colonization. Longleaf pine now occupies only 7% of its historical range due to overharvesting for shipbuilding, widespread grubbing of seedlings by feral pigs, and most of all the suppression of fire, which P. palustris is highly adapted to. A balsam fir cone and needles. Note the round attachments of each needle to the branch and the cone which stands straight up. Photo credit: C.J. Earle. Many fir species are planted in the mid-Atlantic for landscaping and for Christmas trees, but only one species, the balsam fir (Abies balsamea) with a native range in the Chesapeake Bay watershed. It is found in small pockets of high-elevation wetlands, where it grows and reproduces well in the shade of other trees. Firs have needles that extend from all sides of twigs, like a bottle brush, so they can be confused for spruces which hold their needles the same way. Fir needles are flattened and blunt, however, which distinguishes them from spruce needles which are rounded and sharp. If you “shake hands” with a fir, it will be “friendly” (it won’t poke you as a spruce would). Additionally, fir needles are connected directly to the stem on suction cup-looking attachments. Male cones are held on the lower side of branches, while female cones are held on top, standing straight up. Norway spruce (Picea abies) stem. Note the sterigma, the woody twig extensions on which each needle is mounted. Photo credit: Ryan Davis. Like firs, spruces are mostly found in the Chesapeake Bay Watershed as landscaping or in Christmas tree farms. Norway spruce (Picea abies) is especially common for landscaping, but of course native to Europe. The degree to which Norway spruce is an invasive plant is a matter of debate, but whether or not it invades, if you’re planting a tree for wildlife value it should really be native (in this particular author’s humble opinion). There is one native species of spruce in the watershed, also relegated to high elevations: red spruce, Picea rubens. Red spruce is broadly tolerant of moisture conditions and quite tolerant of shade, but is declining steeply in the watershed due likely to a combination of climate change and air pollution. Spruce needles also extend from all sides of twigs. If you “shake hands” with a spruce however, it’s not friendly, but “spiky”. The stiff, rounded needles are typically sharp and can easily protrude through light gloves. Each needle is attached to the stem via a woody peg, the sterigma, which is actually a projection of the twig. Mature cones dangle downward rather than stand up straight like fir cones do. 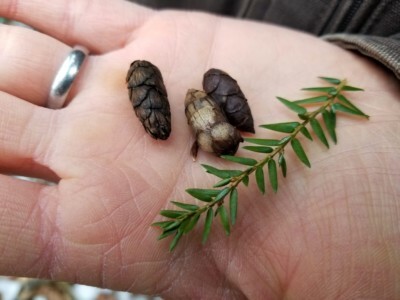 Eastern hemlock cones and branch. Note how the needles are mostly held to the side, with some “ski jump” needles that sit on top of the branch, angling towards the tip. In this photo, some of the “ski jump” needles are upside-down; note the two parallel white lines. Each needle has a small stem which is attached to a sterigma. Photo credit: Ryan Davis. Eastern hemlock’s flexible branches bend with snow. Photo credit: Allyson Wells. Many people seem to know that Socrates was sentenced to death by drinking poison hemlock. How this piece of trivia has remained resonant thousands of years later while so many important lessons are immediately forgotten is baffling, but every American should know that our trees of the genus Tsuga are not poisonous. 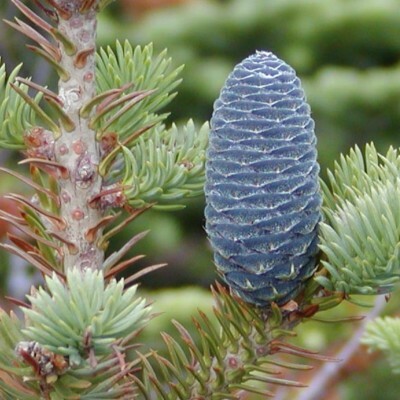 They are wonderful members of our forests that are considered by many to be keystone species, and are not toxic at all (rather, the needles make a tasty tea). According to historical ecologist Dr. Chris Marshall, European settlers deduced that the tree was obviously evil because it was a denizen of land that was hard to farm and wasn’t as valuable for timber like many other conifer species they encountered. They named the tree “hemlock fir”, tying the hardy Tsuga to the poisonous herb, Conium maculatum, which the colonists knew and loathed from Europe. That being said, the following loving description is about the important trees, not the invasive herb. Two species of hemlocks are found in the east: Carolina hemlock (Tsuga caroliniana), which is relegated to the high elevation forests of the southern Appalachians, and eastern hemlock (Tsuga canadensis), which is common across the northeast and in mountainous areas of the southeast. In silhouette, eastern hemlock is conical but the “terminal leader”, the stem at the very top of the tree, typically droops a bit rather than standing up straight. All branches are notably bendy and the entire tree can is often described as delicate, graceful, or feathery, setting the hemlock apart from spruces and firs, which are denser and stouter. 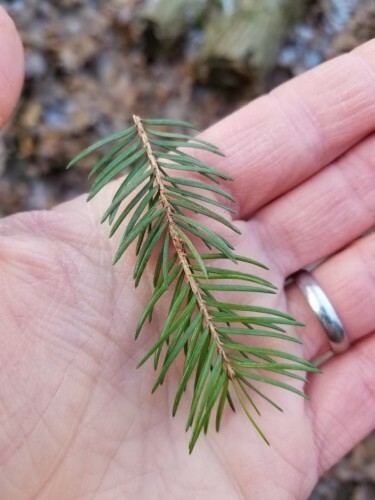 Up close, eastern hemlock needles are short and flat, with two parallel white lines on the underside of the leaf. Most needles are held to either side of the branch (as opposed to firs and spruces which typically have needles in all directions), but there are notably needles that sit on top of the branch, angling towards the branch tip. Each needle has a small stem that is attached to a woody peg that connects to the branch. Hemlock cones are small and delicate. Eastern hemlock is a slow-growing tree that can tolerate shade and rocky, wet soil. It can grow to be 6 feet in diameter and 160 feet tall, and live for nearly 1000 years. Its slow, steady growth, even under a full canopy, results in its status as the “climax species” in much of New York, Pennsylvania, and West Virginia; in the absence of disturbance, a canopy of enormous, old hemlocks would dominate forest stands. This mighty, beautiful tree is tough but has a notable weakness: the hemlock wooly adelgid. This invasive insect slowly weakens hemlocks by drinking their sap, usually resulting in the tree’s death within a decade. The beloved eastern hemlock (indeed, the state tree of Pennsylvania) is in big trouble due to this tiny insect. 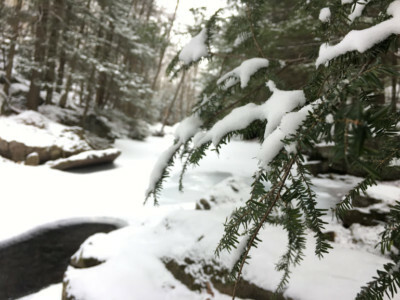 Cold winters set the adelgid back, and chemical treatments can help individual trees, but we are rapidly losing our hemlock forests, which have been keeping our mountain streams cold and clean for centuries. Genetic records show a severe bottleneck in hemlocks several thousand years ago, so perhaps there is a chance that this ancient genus will persist yet again. Want to learn more about telling the difference between conifer genera? Check out What’s That Conifer?, the first of our new Tree Talk video series! And as always, Forests for the Bay is an excellent resource for learning more about your woods.